Using credit card spending to rack up miles can be incredibly rewarding and allow you to earn a free flight. What many people don’t know is that they can take advantage of promotions offered by airlines and their partners to quickly boost the number of miles in their frequent flyer account and put them on the fast track to their next vacation. Which airlines have the most offers and give away the most miles? 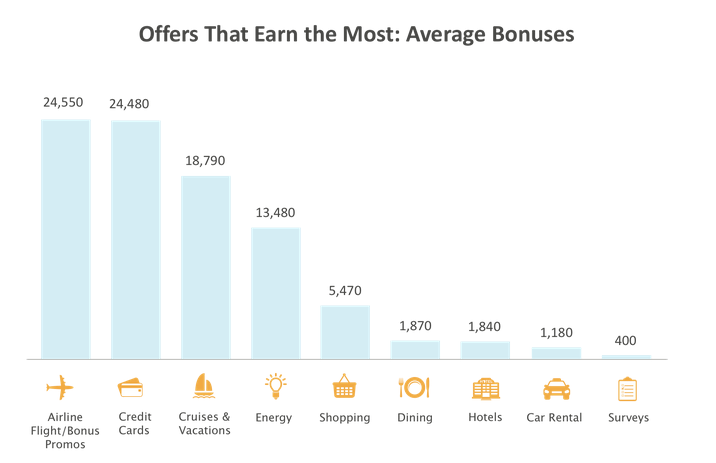 And what types of promotions are the easiest to find and which earn the most bonus miles? The RewardExpert Mileage Booster Study took a closer look at nearly a thousand promos offered in the first half of the year to answer those questions. Those offers and new ones are posted daily in our promo feed. Airlines and their partners offered over four million bonus miles as part of special promotions in the first six months of 2016. The study looked at close to 1,000 offers from more than 30 carriers. U.S. legacy carriers—American, Delta and United—offered the most miles to their frequent flyer members. 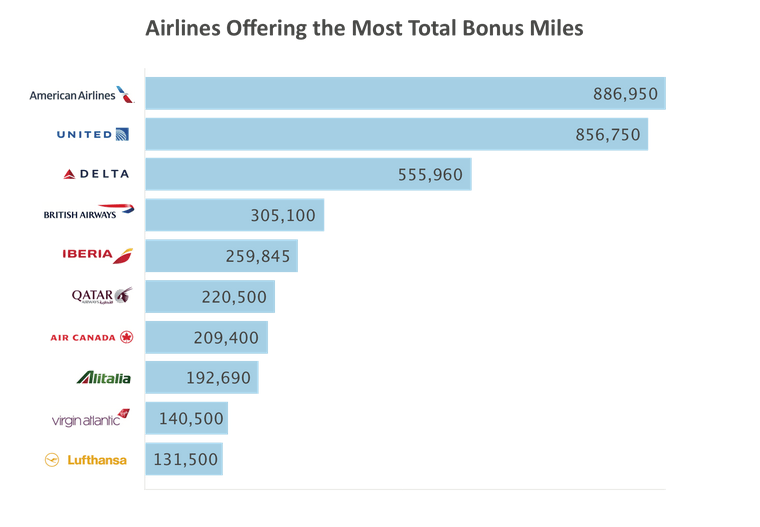 These airlines gave away nearly half of all the bonus miles we tracked and were the only three domestic carriers on the top 10 list of total miles offered by airlines and partners. Low-cost carriers JetBlue and Virgin America were among the airlines with the most miles per offer. These budget carriers made the top 10 list of carriers offering the most miles per individual deal, so while they didn’t offer the most miles overall, many of the offers they had were big. Hotel promotions made up more than half of all offers found. They aren’t the most valuable deals with an average of 1,800 miles per offer, but they are the easiest to find because there are so many. Credit card sign-up bonuses, vacation packages, cruises and special flight promotions were some of the biggest bonus mileage offerings. These types of deals are the most lucrative, but they account for only 13% of all offers, making them tougher to track down. Signing up for a travel rewards credit card is one of the easiest way to quickly boost your balance. Cards offer up to 100,000 points or miles, which can get you a roundtrip ticket to Europe with enough leftover for a domestic roundtrip as well. It comes as no surprise that the three big legacy carriers—American, United and Delta—offered the most bonus miles over the past six months with offers totaling over 800,000 miles each for the top two airlines. No other domestic airline beyond the three big ones made the top ten list in terms of sheer volume of miles offered. The rest were foreign carriers led by British Airways with over a quarter million miles in deals in the past six months alone. American topped the list with a whopping 886,950 miles, which is 18 percent of the miles offered by all of the airlines we surveyed combined. United was a close second with 856,750 bonus miles, but Delta lagged behind by over 300,000 fewer miles than the two biggest promo miles distributors. The three big legacy carriers accounted for nearly half of all the bonus miles offered through promotions. How’d they do it? In part by having some significant offers for vacation package deals, cruise bookings, flight promotions and credit card sign-up bonuses. Smaller airlines offered significantly fewer deals, but sometimes with bigger payouts. So what are some of the biggest offers besides credit card sign-up bonuses? Look at energy companies. NRG Home Solar partnered with a variety of airlines, including United and American, to offer 30,000 miles for adding solar panels to your home. And for those who didn’t want to install anything, just switching to a different energy provider, including many who specialize in green alternatives, could earn up 20,000 miles with most of the domestic airlines we looked at. Travelers can expect to receive more miles from carriers on our top ten list than with those on the bottom. Turkish Airlines, for example, was near the bottom of the list offering an average of only 690 miles per deal. 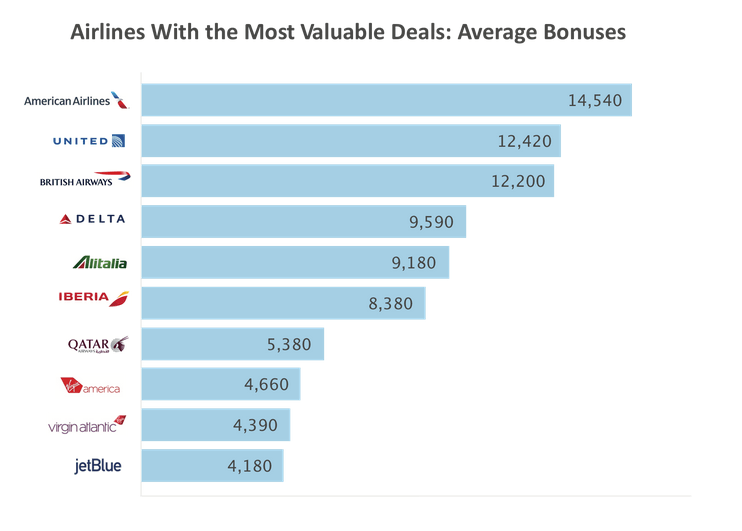 American and United top this list as well, solidifying their positions as the airlines with the most generous bonus offers as well as the ones with the most overall miles in the promotions marketplace. Notably, two additional domestic airlines—low-cost carriers Virgin America and JetBlue—also made the top ten list for for biggest offers on average. There were over 500 hotel promotions, worth a total of nearly a million miles, which accounted for over half of all the offers we collected. The next largest category, car rentals, made up only 15.4 percent of the available offers. Typically, hotel promotions award you a set number of extra miles per stay or per night. Many of those offers are worth around 500 miles, but we found some exceptions that ranged into the tens of thousands of miles. Virgin America, for instance, offered 50,000 points for a seven night stay at Sir Richard Branson’s private island in the Caribbean. A seven-night stay at Necker Island ranges between $29,960 and $48,300 per couple, and the whole island can be rented for $78,000 a night. You have to wonder if anyone who can afford to stay there would really care about roughly $800 worth of Virgin America points. Many of the categories with the fewest number of offers, such as energy, credit cards and airline flight promotions, were also among those that earned the most. “Big earning promo categories gives travelers a good idea of where the miles are available to help them better align spending with their lifestyle to maximize rewards,” added Clancy. 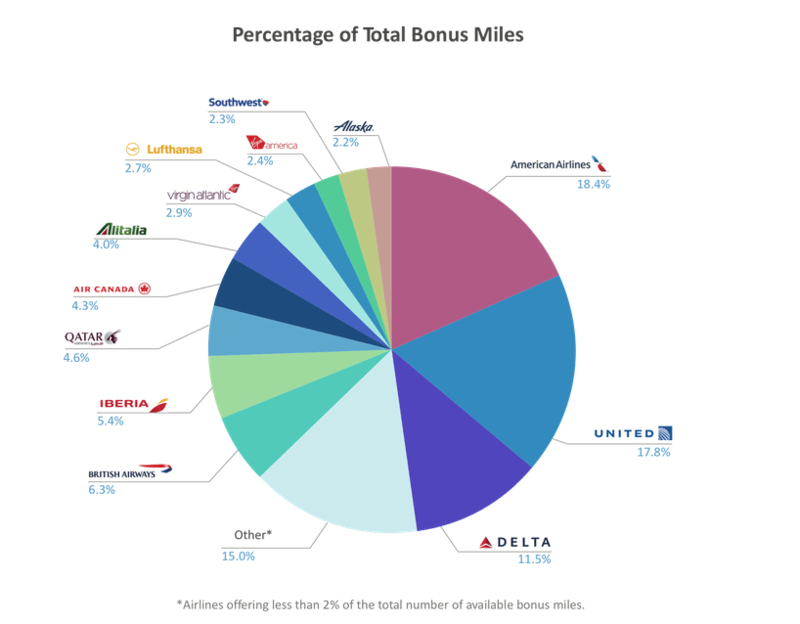 The most valuable category of airline flight/bonus promos includes all airline promotions that don’t have a third party, like bonuses for buying or gifting miles, flying in premium cabins and booking tickets on certain routes. It’s worth noting that while hotel deals accounted for more than half of all the promotions in the last six months, that category came in at number seven with an average of only 1,840 miles per offer. So, how do you earn the most miles? Everyone’s spending and traveling preferences are different. You can, for instance, earn a lot of miles quickly if you book with a cruise line that’s partnered with an airline. If you never go on cruises, though, that won’t work for you. But there are plenty of opportunities for everyone regardless of what they buy or how frequently they travel. The three big U.S. legacy carriers—American, United and Delta—are good bets in general, because they not only had the most overall miles up for grabs, but on average, their promotions were among the most valuable, with an average of 14,540, 12,420 and 9,590 miles available per offer. The only other domestic carriers to make top ten lists were JetBlue and Virgin America. Their offers averaged more than 4,000 miles each. Certain types of promotions were more lucrative. 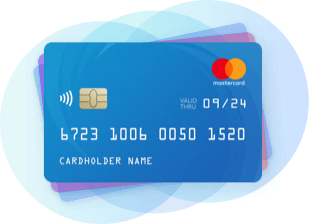 Credit cards and their big sign-up bonuses are a natural go-to for some quick miles, and they neared the top of the list for both types of promotions with the most total miles offered and with the most miles available per offer. Another great place to look for some big bonus miles is at promotions offered directly from an airline. They typically include extra miles for specific flights and bonuses for buying or gifting miles. Carriers often offer double or triple miles on new routes they’ve just introduced. If you are thinking about taking a cruise or booking an airfare and resort package deal, definitely see what you can get through your favorite airline travel portal. Those offers are typically worth a lot of miles. RewardExpert regularly posts new airline promotions to help users earn miles with their favorite frequent flyer programs. Over 900 offers from over 30 frequent flyer programs were collected between January 1 and June 30, 2016. Those offers made up the dataset used for this study. The promotions were grouped into 10 categories for analysis. If there were fewer than 10 of any type of offer, they were included in the other category. Airline flight/bonus promos include all promotions offered by an airline without the involvement of a third party. Special flight promotions, cabin class bonuses and deals for buying or gifting miles made up the majority of these offers. 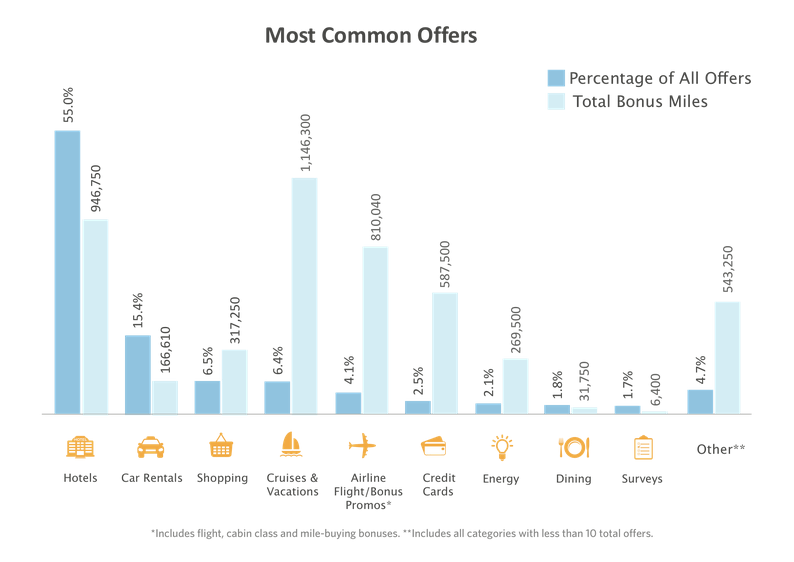 Only offers that had a clear earning potential were used to calculate the average and total bonus miles. Some promotions, such as those that earn 10 miles per dollar spent, were excluded from those calculations. If there was a range of potential miles that could be earned, the maximum was used. For example, if you could get between 50 and 200 miles for subscribing to a magazine, then the amount of 200 miles was used when calculating the overall and average bonus miles. The study excluded offers from airline shopping portals because they are difficult to track. The promotions are often short-lived, sometimes lasting only a few days or even hours, and airlines partner with hundreds of different venders. Also, many of the details, such as expiration dates and earning limits, are either omitted from those offers or are difficult to find. And most are based on how much you spend which is difficult to measure.